Slovenia is not a big country; it roughly measures the size of the state of New Jersey. Shaped like a chicken facing east, the nation is wedged into the space between Italy, Austria, Hungary and Croatia. Although it doesn’t have a large landmass, it certainly has diverse landscapes: towering mountains, crystal-clear lakes, vibrant and historic cities, a dramatic coastline, massive caves, wide open farmland and hundreds of vineyards. Shop for wine travel accessories on Amazon! The country’s small size coupled with ample wineries inspired a journey; a cross-country wine tasting adventure. We collaborated with Find Eat Local and Savor the Experience Tours on an epic one-day, three-winery expedition beginning on Slovenia’s eastern border with Hungary traveling 185 miles across the country to the western border with Italy. On a trail that we dubbed the Slovenian Wine Highway, or SLO Wine Highway for short, we set out on an overcast day for an unforgettable ride across the length of Slovenia. Starting in the ‘chicken head’ and moving to the ‘tail feathers,’ we sipped, savored and taste-tested our way across the country, indulging at three wineries in distinctly different regions. We traveled from Hisa Vina Cuk on the Lendava Hills in the Prekmurje region to the contemporary Hisa Vina Doppler on the sloping hills of the Styria region all the way to the western border to Hisa Vin Rondic in the small, wine-producing town of Slap in the Vipava Valley. During the day filled with flowing wine, we feasted on regional delicacies, each winery presenting us with unique specialties. Travel across beautiful Slovenia with us as we taste the flavors and meet the people behind the vines! It was barely past 8:00 in the morning when we stood on the lawn at Hisa Vina Cuk watching a thick fog roll in, engulfing the perfectly straight rows of vines that covered the hills. Eva was welcoming us to her family’s home, a traditional house with a thatched roof. She casually balanced a bottle of sparkling wine in one hand, while holding a saber in the other. In one swift motion, she used the saber to slice open the wine, its bubbly contents spilling from the top. Our Slovenian Wine Highway was officially underway. The Slovenian-Hungarian family at Hisa Vina Cuk has been producing wines on the Lendava Hills in the Prekmurje region for several generations, but the history of the land stretches back much further. Stories of heroes, enemies and lovers from the early 1600s played out on the very land where Cuk’s grapes are grown. The tales of the legends are woven into the wine they produce today. Cuk wines – Hadikova Kri, Piroskine Solze and Banffy – are named after the characters in the stories creating a deep connection between the history of the land and Cuk wine. While wine is the focus of the Cuk family, it’s not their only product. Homemade is their mission and nearly everything they serve – from meat to vegetables to breads and spreads – are created in-house. We were treated to homegrown ‘100-year-old’ air-dried ham, meso iz tunke (meat baked in lard) and beef sausage from Cuk-raised Scottish Highland cattle. Accompanying the meat was Grandma’s fresh-out-of-the-oven perec, a white bread popular in Prekmurje, that we smothered in ajvar (red pepper relish) and zaseka (minced lard), a spread I can only describe as better than butter. As the salty, calorie-laden food passed by my lips, I thought only of the freshness and how well it paired with their Piroskine Solze rose wine. From the sunlit dining room, we descended into the cellar for more sampling, but this round was Cuk’s homemade brandy they call vinac. In the cool, brick room, we swirled and sipped savoring the new warmth in our bellies. Eva had made us feel so welcome, we could have easily stayed at Hisa Vina Cuk all day, but making only one stop is hardly a Slovenian Wine Highway. We arrived giving handshakes and left with hugs. Our last moments were spent on the terrace, overlooking the vineyards where the fog had lifted. We couldn’t see borders, but we knew our gaze fell on two other countries – Hungary and Croatia. From the vineyards below, cheering erupted; a celebration that this year’s harvest had come to an end. Meanwhile, our day was only beginning. Our Slovenian Wine Highway was taking us through small villages 50 miles northwest in the direction of Maribor to Hisa Vina Doppler in the Styria region. The area, less than five miles from the Austrian border, has long been known for its prosperous winemaking. In a place where the past is so well-preserved, however, we were visiting a winery that is breaking from tradition – both in style and in management. We drove up the one-lane road through acres of vines on the Pesnica Hills 1,250 feet above sea level to the contemporary establishment, Hisa Vina Doppler. The minimalistic architecture – a simple, gray building with a sleek outdoor space – felt supremely urban amidst the green, rolling hills; the juxtaposition a true introduction of chic design meets idyllic charm. A single tractor puttered through the vineyard, two workers piling containers of grapes on the wagon behind it. A klopotec – an old-style wooden wind-clapper similar to a windmill, but is used to scare the birds from the vineyards – stood overlooking the modern winery. But what truly captured our attention was the 360˚ views of forest-covered hills and deep valleys dotted with church steeples. The land at Hisa Vina Doppler was established as a vineyard estate by the Benedictines from Austria in 1815. In 1938, Ivan Doppler purchased the winery, which today is still family-run. In recent times, however, Hisa Vina Doppler has adopted a forward-thinking approach. Not only are they progressive in their state-of-the-art facility, but also in their ownership. For the past two generations, women have been running the winery; a role traditionally held by men. In 1992, Ivan passed the ownership to his daughter, Veronika, who subsequently passed it on to her daughter, Mihaela, the current owner. This new custom of female ownership could continue as Mihaela’s teenage daughter is currently being groomed to be her successor. With threatening storm clouds lingering in the distance, Mihaela greeted us on the patio with a glass of Diona. The sophisticated sparkling wine paired perfectly with the classy location and was enhanced by the extraordinary combination of parmesan cheese and fresh raspberries drizzled with honey. The cutting-edge cellar has the air of a hip art gallery. Large, dramatic photographs hang on most walls, except for one that is covered in graffiti left by guests. Wine barrels are enclosed behind a wall of glass and bottles of fermenting wine are fashionably displayed. The high-tech wine processing equipment, essentially a small laboratory, is neatly tucked away in an adjoining room in the cellar. At Hisa Vina Doppler, they excel at making white wine, particularly sipon. The regional varietal, which was named after a Frenchman proclaimed, “C’est si bon,” meaning “It is so good,” is known to be light and refreshing. Doppler’s signature wine, 360˚, is aged for 18 months and is made each year in limited quantities from the finest grapes of the harvest. The bottle we were tasting was made exclusively from sipon grapes. Although our preference is for red wines, Hisa Vina Doppler’s 360˚ surprised us; full and rich with a smooth buttery taste, we couldn’t help but ask for a second glass before our departure. From the Styria region, our Slovenian Wine Highway headed west 135 miles toward Vipava Valley to the town of Slap and Hisa Vin Rondic. Along the journey, the promise of rain came to fruition. But, the skies cleared as we approached Slap, a town with deep roots in wine growing and a population of 427 residents. On our arrival to Hisa Vin Rondic, we were warmly welcomed and led into the 250-year-old family home by young newlyweds, Tanja and Matej – the daughter of the current owner and her husband. As we stepped through the door, we were greeted with the pungent scent of fermenting grapes. In the entryway were seven vats filled to the brim with a bounty of the season’s cabernet harvest. Adhering to traditional red winemaking methods, the concoction is stirred several times a day for ten days before being transferred to tanks and barrels. We offered our help in the stirring process, but quickly realized it was much more difficult a task than it appeared. Since the rain had eased, we set off for a stroll in Hisa Vin Rondic’s 27 acres of vineyards where they primarily grow white varietals, including malvazija and pinela, a rare and indigenous grape. Pinela grapes are used to make a fresh wine with a slight copper taste and, at Hisa Vin Rondic, it is bottled unfiltered. The vineyards, which stretch across the hills, are subjected to the Burja wind, both a blessing and curse to winemakers in the region. While the wind excels in keeping insects at bay, its fierce force, which can exceed 125 miles per hour, can also wreak havoc on the tender grapes. On our visit, the wind was still – and the sun peeked out from behind the clouds just in time for sunset when we sipped our first glass of pinela wine. Back inside the family’s home, we settled into the newly renovated tasting room. Glasses of malvazija were poured as we feasted on homemade specialties of jota (soup of cabbage, pork and beans), frtalja (baked egg with sage), local sausage and bread. As food flowed from Grandma’s kitchen to the table, they indulged us with the history of the house and wine. With gloved hands, Matej presented an original copy of Vinoreja, a winemaking book written in 1844 by Slovenian Matija Vertovec that was discovered in the home and includes the author’s personal inscription. In the dimly lit, rustic cellar, we gathered around old wooden barrels to taste a special wine that Matej retrieved from behind an iron gate. The dusty bottle contained a nine-year-old cabernet, which was decanted and swirled – and can best be described as tasting like Christmas in a bottle. As much as we didn’t want our time at Hisa Vin Rondic to end, we had one final glass of label-less, homemade vinac and then, with promises of a return trip, said our goodbyes for the evening. Our Slovenian Wine Highway had officially ended, but we weren’t quite done yet. We had one more stop to make before calling it a night: Skerlj Tourist Farm and Restaurant. Driving along a curving road through tiny villages, we wound our way to Tomaj in the heart of Slovenia’s karst region just three miles short of the Italian border. The history of the Skerlj family-run farm can be traced to the 17th century, but it was in 1995 that they opened their doors to the public. Using their fresh, quality ingredients, Skerlj creates full-flavored seasonal dishes – like pumpkin strudel and eggplant lasagna – which are complimented by their homemade teran wine. The heavy red wine full of berry flavors was also the featured component of the sauce served with our roasted veal and prosciutto entree. Homemade honey ice cream was the final course, balancing the richness of the meal. To be sure we concluded our day of Slovenian wine on the right note, we relished a glass of Skerlj’s teran liqueur; the sweet and robust drink a perfect ending to our wine-filled day across Slovenia. Looking for a place to stay in Slovenia? Search hotel deals on Booking.com! We want to know: Have you tried Slovenian wine? 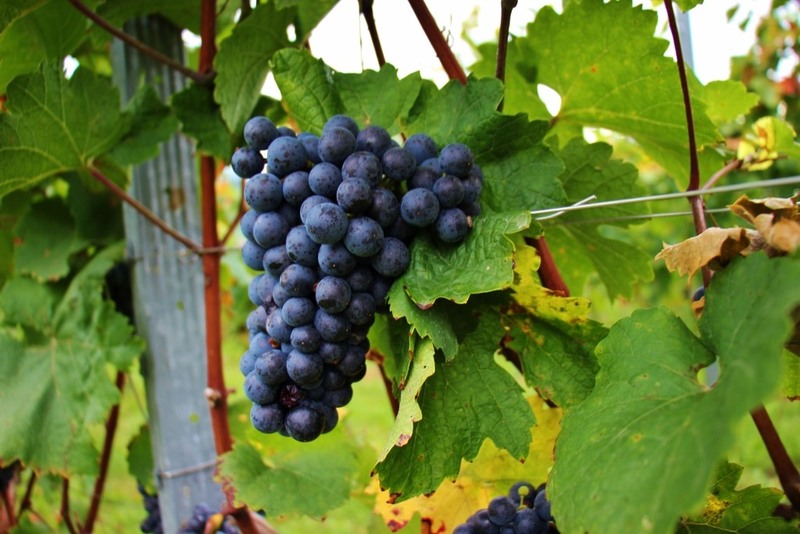 Would you tour the country to taste Slovenian wine? What epic wine tasting experiences have you had? Tell us in the comments! Slovenian wine, I rememeber when it was a secret hehe. What an adventure, other than sipping my way through the bars in Ljubljana to try lots of different ones out ‘research’ I haven’t explore as much of the country as I would like. Now, new wine plan! We love doing wine ‘research’ 😉 Highly recommend traveling around Slovenia – absolutley amazing what is beyond Ljubljana (not that LJ isn’t amazing on its own!). Brilliant post. I loved the wine tasting we did in Slovenia too – and it was such a surpirise as I never knew they made so much wine!! 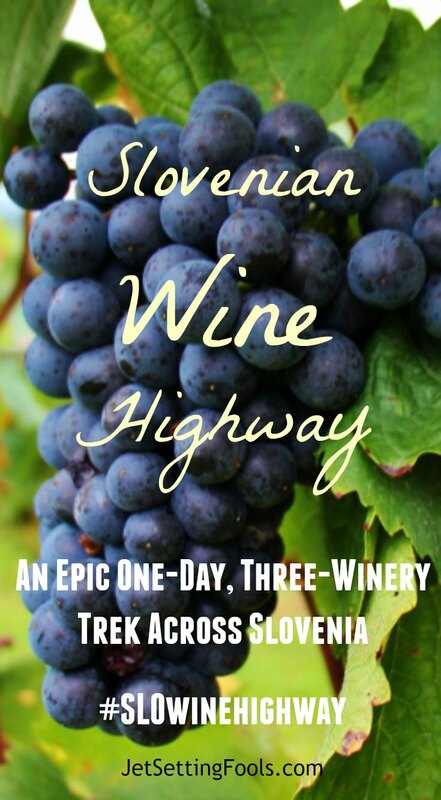 The Slovenian Wine Highway sounds pretty awesome. Can you put in a small table of all the pairings you had?? Great idea! I’ll try – there were so many wonderful dishes!! I did a wine tasting tour of Slovenia… It’s such a hidden secret that Slovenia has good wine… it was AMAZING! This is indeed a stimulating post and you really had a heady experience. I am sure you had a great experience. I would love to experience this some day. Thanks for the comment Vyjay – I hope you make it to Slovenia someday! I can’t praise Andrew Villone and his tour group enough. Four of us travelled through Croatia, Slovenia, Bosnia Herzegovina and briefly in Montenegro for 25 fabulous superbly organised days of wine, beautiful food, farm stays which were magic, B & B’s, pensions, and all with excellent guides. Slovenia would be my favourite country but all of them were unique and distinct in their own way, and we learnt so much and travelled so far. We were taken to magnificent parks, great buildings, over the Julian Mountains, visited small villages and magnificent ancient sites and churches. I thoroughly recommend Andrew’s ‘Roads Less Travelled’ travel company. Brilliant! The views, the wine, the food – all of it was spectacular! Hope you make it to Slovenia one day – it’s a lovely country! What great trail! While I have seen a few, this looks much better as it combines gastronomic pleasures with great views. During the day, we really had it all! Stunning landscapes, amazing food and wine and excellent company! If you ever make it to Slovenia, it is highly recommended to get out of the city and into the countryside. Slovenia itself looks amazing, but pair that with incredible food and wine, and you’ve just stopped our beating hearts! It looks like a fantastic experience! Thanks for sharing! Exactly! Good food, good wine…awesome country! Cheers! I had absolutely no idea Slovenia was such a wine country! Looks beautiful and it’s always been on my wish list. The best kind of tourism is culinary atleast for me so this is something I’d consider when I make any travel plans. Thanks so much for sharing ! This is just beautiful! The food looks awesome, as does the wine. I would have enjoyed this very much. Next year, we plan on focusing on East Europe travels in addition to our own big backyard in Spain. I’ve heard such good things and l think we will add this to the list :-). A very polished piece. Better every time! This is right up our alley! My brother and his wife just got back from Lake Bled with incredible photos, so we already have Slovenia on our minds. Now I’m thinking we need a good week or two in Slovenia to experience all of the beauty. The wine highway will definitely be high on our list given our absolute love for wine!